718.25 GBP In stock, ready to dispatch. The Origin Urethane Olympic Weight Plate has a triple handle design which allows for improved grip and greater handling. This design also allows for a variety of other exercises. The black finished steel inner ring means the plates slide onto the weight bar or storage racks with ease, and also protects the outer rubber plate from any damage. The bold weight indicator insert enables easy and quick identification of the weight in KG. Due to the varying diameters of these plates, they should not be used in exercises in which the bar, and / or weight plates are dropped, or lowered to the floor in a less than controlled manner. 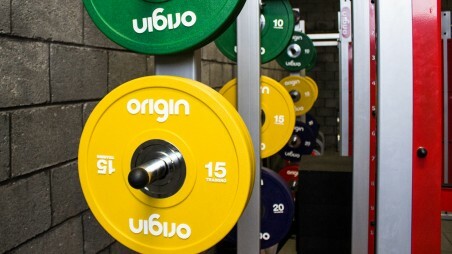 For exercises like these we recommend Origin Olympic Bumper Weight Plates as they have the same diameter, and therefore will disperse the force of impact evenly, reducing the risk of damaging the floor or the plates.